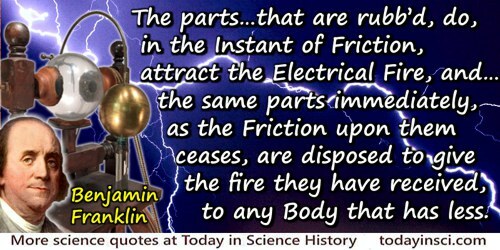 American statesman, scientist, inventor, diplomat, author, printer and publisher known for his electrical experiment, the Franklin stove, bifocal eyeglasses and the lightning rod. Less well know are his efforts establishing public amenities, including a fire company, library, and hospital. 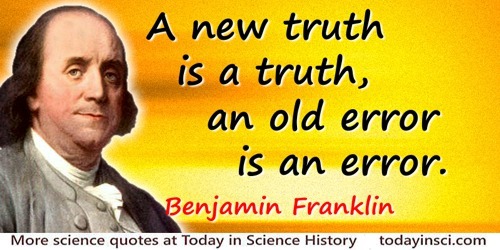 A new truth is a truth, an old error is an error. Don't go to the doctor with every distemper, nor to the lawyer with every quarrel, nor to the pot for every thirst. In Poor Richard's Almanack (1744). I always rejoice to hear of your being still employed in experimental researches into nature, and of the success you meet with. The rapid progress true science now makes, occasions my regretting sometimes that I was born so soon: it is impossible to imagine the height to which may be carried, in a thousand years, the power of man over matter; we may perhaps learn to deprive large masses of their gravity, and give them absolute levity for the sake of easy transport. Agriculture may diminish its labour and double its produce; all diseases may by sure means be prevented or cured (not excepting even that of old age), and our lives lengthened at pleasure even beyond the antediluvian standard. Oh! that moral science were in as fair a way of improvement; that men would cease to be wolves to one another; and that human beings would at length learn what they now improperly call humanity! Letter to Dr Priestley, 8 Feb 1780. In Memoirs of Benjamin Franklin (1845), Vol. 2, 152. I say it is impossible that so sensible a people [citizens of Paris], under such circumstances, should have lived so long by the smoky, unwholesome, and enormously expensive light of candles, if they had really known that they might have had as much pure light of the sun for nothing. 'An Economical Project', The Life and Miscellaneous Writings of Benjamin Franklin (1839), 58. A translation of this letter appeared in one of the Paris daily papers about 1784. He estimated, during six months, a saving of over 64 million pound weight of candles, worth over 96 million livres tournois. In going on with these Experiments, how many pretty systems do we build, which we soon find ourselves oblig’d to destroy! If there is no other Use discover’d of Electricity, this, however, is something considerable, that it may help to make a vain Man humble. Letter to Peter Collinson, 14 Aug 1747. In I. Bernard Cohen (ed. 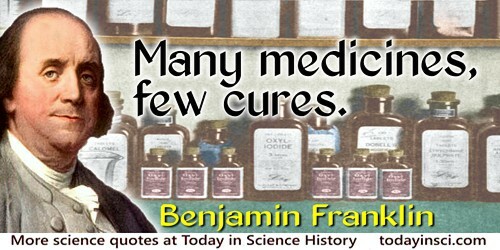 ), Benjamin Franklin’s Experiments (1941), 63. In New England they once thought blackbirds useless, and mischievous to the corn. They made efforts to destroy them. The consequence was, the blackbirds were diminished; but a kind of worm, which devoured their grass, and which the blackbirds used to feed on, increased prodigiously; then, finding their loss in grass much greater than their saving in corn, they wished again for their blackbirds. Letter to Richard Jackson, 5 May 1753. In Albert Henry Smyth, The Writings of Benjamin Franklin (1905), Vol. 3, 135. Let the experiment be made. Letter to Dr L—, 18 March 1755. In I. Bernard Cohen (ed. 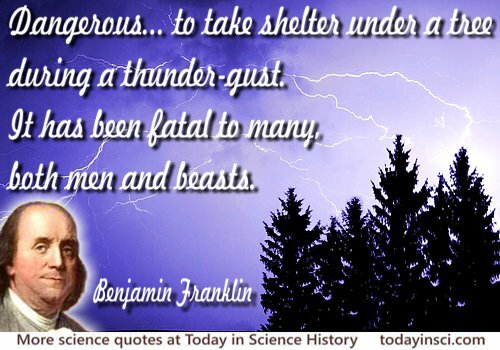 ), Benjamin Franklin's Experiments (1941), 334. No. 332, Poor Richard’s Almanack (Jan 1748). Collected in Poor Richard's Almanack (1914), 35. Love, Cough, & a Smoke, can't well be hid. In Poor Richard’s Almanack (1734). Money never made a man happy yet, nor will it. There is nothing in its nature to produce happiness. The more a man has, the more he wants. Instead of filling a vacuum, it makes one. 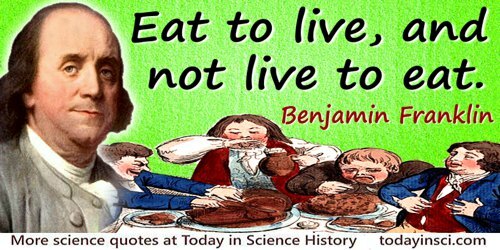 One should eat to live not live to eat. As quoted, without citation, in John Walker, A Fork in the Road: Answers to Daily Dilemmas from the Teachings of Jesus Christ (2005), 83. Letter to Jean Baptiste Le Roy, 13 Nov 1789. Quoted in Albert Henry Smyth (ed.) 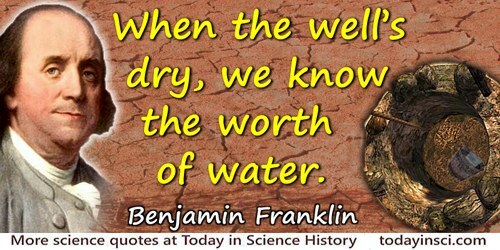 The Writings of Benjamin Franklin (1907), vol. 10, 69. But who grows mad by studying good to grow. The best of all medicines are rest and fasting. In James Wood, Dictionary of Quotations from Ancient and Modern, English and Foreign Sources (1893), 426:34. The greatest inventions are those inquiries which tend to increase the power of man over matter. Unverified. If you know a primary source for this quote, please contact Webmaster who searched and, as yet, found none. In Poor Richard's Almanack (1736). Time is a herb that cures all Diseases. He's but a caterpiller drest. In Poor Richard's Almanack (1740). What is the use of a new-born child? When asked of the use of a new invention. 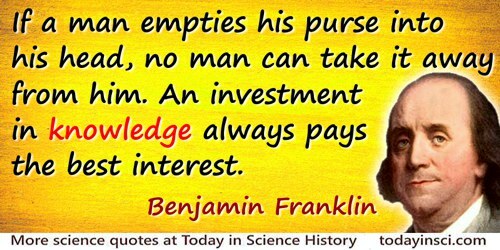 In I. Bernard Cohen, Benjamin Franklin's Science (1990), 38. What science can there be more noble, more excellent, more useful for men, more admirably high and demonstrative, than this of the mathematics? In Poor Richard’s Almanac (1757, 1900), 23. [Franklin always found it a] pleasure ... to see good workmen handle their tools. He snatched the lightning from the sky and the sceptre from tyrants. 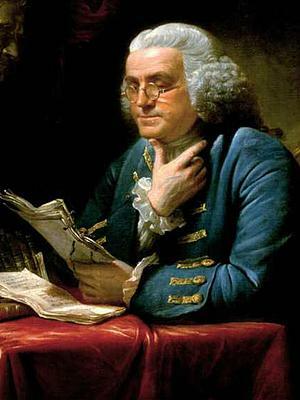 Admiring Benjamin Franklin in a letter to Samuel P. du Pont, c. 1779. In I. Bernard Cohen, Benjamin Franklin's Experiments (1941), xxvii. In Dr. N Sreedharan, Quotations of Wit and Wisdom (2007), 35. My ideal man is Benjamin Franklin—the figure in American history most worthy of emulation ... Franklin is my ideal of a whole man. ... Where are the life-size—or even pint-size—Benjamin Franklins of today? Describing his personal hero, in a lecture (1964). In Gerald James Holton, Victory and Vexation in Science: Einstein, Bohr, Heisenberg, and Others (2005), 92. In John S. Rigden,Science: The Center of Culture (1970), 111-112. 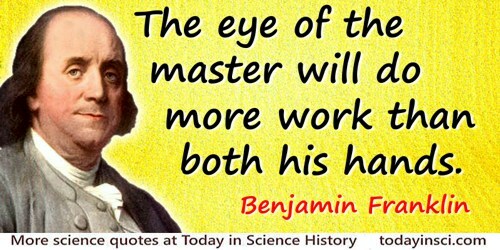 In Rabi, Scientist and Citizen (2000), xxv, the author states that a portrait of Benjamin Franklin hung in Rabi's office. From 5th Lecture in 1816, in Bence Jones, The Life and Letters of Faraday (1870), Vol. 1, 218. In The Lost World of Thomas Jefferson (1948, 1993), 178. 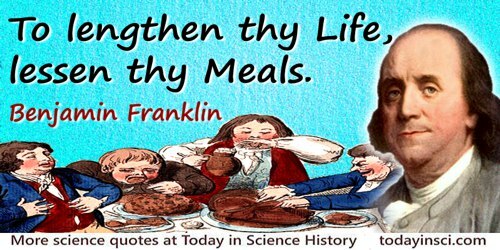 17 Jan - short biography, births, deaths and events on date of Franklin's birth.